Why donate for the World Future Council? We at the World Future Council work to pass on a healthy planet and fair societies to our children and grandchildren. To achieve this, we focus on identifying and spreading effective, future-just policy solutions and promote their implementation worldwide. Our Council consists of up to 50 international change-makers who identify urgent themes and determine the agenda for our work. Our Policy and Expert Teams are based in Hamburg, London, Geneva, Beijing and Windhuk, and we fully rely on donations to operate. Only with your support we can spread future-just and sustainable policy solutions. How can I donate to the World Future Council? Using our Online Donation Form you can donate simply, quickly and securely. Is it better to donate to a project or the general fund? If you donate to a specific department, the WFC will ensure the donation goes directly into the project work. In the case of donations going beyond the financial needs of a project, it is permitted by law that we use the funds for other projects in need. Of course, the donator will receive notice in that event. If you donate to the general fund, the WFC is free to use them where they are needed most. Donations to the general fund are more efficient because we can make quick decisions on where funds are needed, thereby reducing our administrative expenses. How secure is my personal information when donating online? When do I receive a donation certificate? For donations up to 200 Euros, the paying-in-slip or the bank statement is sufficient for being considered as a receipt for charitable donations. For donations exceeding 200 euros, a donation certificate will be issued. I fear my donation is getting lost in administration! As every other organisation, we need administration to operate. Our admin team deals with all HR related affairs, issues donation receipts, pays our monthly bills for e.g. office rent or telecommunication, replies to email enquiries, sets up hardware and software for us to work, negotiates contracts, organises conferences and meetings, provides assistance if yet another computer problem arises, and much much more. Media and Communications, that means our team for social media channels, website etc., are also paid this way. We are a small organisation and make sure no money is being wasted. Find out more about our financials in the Annual Report below! In other words: No, your donation is not lost in administration – with every donation, you also give a share to our administration team without whom we couldn’t do our work. We give a voice to future generations and stand up for their rights. Through our support, millions of people benefit from better policies and political action. Your donation enables us to continue our work to make the world a more sustainable place. 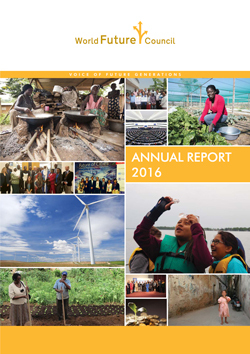 Our latest annual report provides an overview of our international work since the beginning of 2015. We have been busy bringing together experts from around the world to discuss and share existing solutions to today’s problems.